Add some details, this necklace has a little of every thing all rolled in to one necklace. Smaller Swarovski crystal drops transitions into a larger feature centre crystal drop. With little bi cone crystals trimming on edges. The perfect wedding necklace for a storybook wedding. 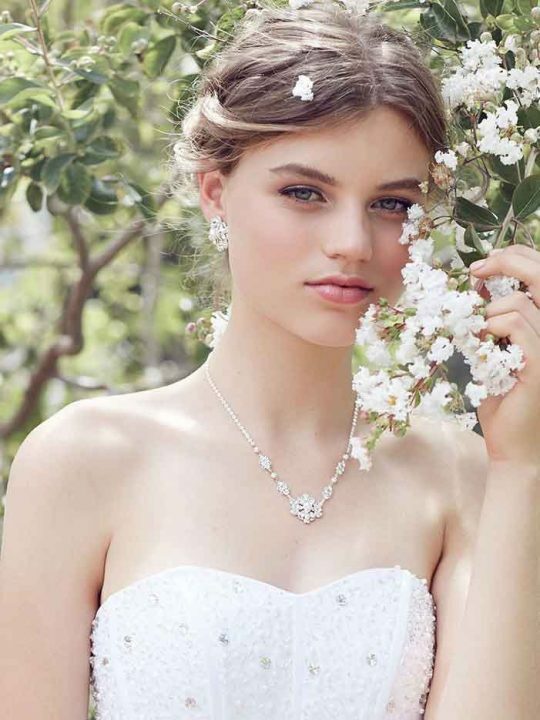 The Deluxe Nirvana Wedding Necklace is designed with our signature tear drop diamonties. Featuring a crystal and diamontie drop combination through out the design. The seven findings feature encrusted diamonds in a circle flower like pattern. 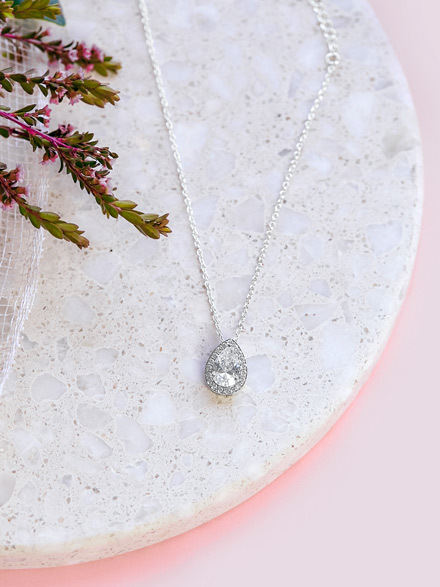 This gives gorgeous texture in line with this year’s wedding jewellery trends. The Hello Lovers Australia label is our featured collection of wedding jewellery and lace wedding dresses. Your wedding dress and jewellery are the most important wedding pieces that you’ll ever buy. At Hello Lovers Australia, we want you to feel special. With gorgeous wedding jewellery and bridal dress that is just the right choice to complement your personal style. Available in Silver, can be custom made in gold or Rose gold. Length of centre drop 3cm, smaller drops 1.3 cm, length of chain 43cm, chain links 6cm. Now let’s add some accessories! For an over-the-top look add a diamante hair comb with plenty of shine, for your fairytale wedding. Choose to wear this necklace with or without a veil. Match the Nirvana wedding earrings to complement to the lace design of this piece. Comes packaged in a pretty silk pink Hello Lovers Australia box.